Seven years after its inception, Gem Gossip has evolved from the public diary of a Nashville-based jewel lover to an industry renowned bauble encyclopedia. Thirty-five thousand (and counting) Instagram followers can't be wrong. Read on for a bit of show and tell with the queen of #SHOWMEYOURRINGS. I have yet to find a women’s perfume that I love – I’m mostly into men’s cologne. This agate and gold lion pendant and vintage snake ring are from Levy's in Birmingham, AL. 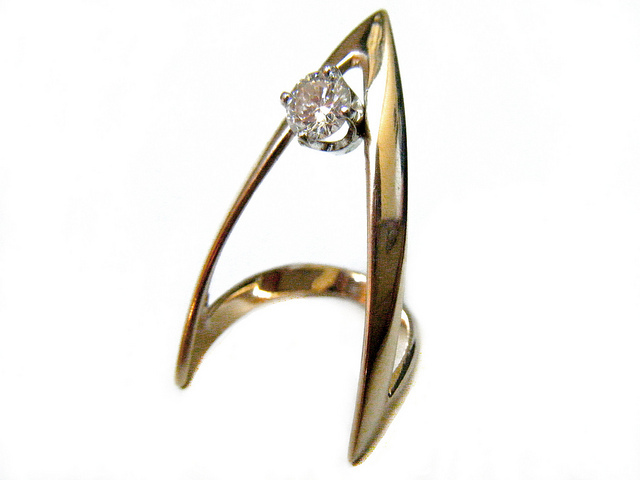 Shown with a Jennie Kwon 'diamond' shaped gold ring. Proud of her Italian heritage, Danielle inherited her grandparents' passports and counts them as some of her most prized possessions. Custom 14K ring, designed by Gem Gossip, available at gemgossipjewelry.com in white or yellow gold. We would go to Adele's in Nashville's neighborhood called The Gulch. Basically everything on the menu is amazing, but I keep coming back to the chopped salad and brownie with ice cream for dessert. Most of my ideal meals involve a light meal and room for plenty of dessert. I've been obsessed with this designer named Zina ever since I visited Charde Jewelers in Houston. Her specialty and entire line is actually sterling silver, but she makes a few pieces in yellow gold – I'm particularly in love with her "Three Wave" ring in yellow gold – it is high on my wish list. I'm attracted to many silversmiths' work, only wishing their pieces were in yellow gold, so I think that's why I was drawn to her. I'm actually the type to go somewhere different each time a vacation opportunity comes up. I like exploring new, never-before-seen places. Our last vacation was Rosemary Beach, my first time seeing the Gulf. This new self-employment thing has allowed me to read more (YAY) which was one of my goals since forever. I've accumulated an insane jewelry library throughout the years, and now I am finally getting the chance to actually read these books which have been decorating my office for years. I just finished Rings: Miniature Monuments to Love, Power and Devotion by Diana Scarisbrick and it was a good one! It basically depends on which hotel I'm staying at, but usually the answer is whatever spots are available where I'm staying at! I like the idea of working hard all day, going back to the hotel for a drink and only having to go up the elevator to call it a night! I'm currently putting together a blog post about punchy, vibrant colors for Spring/Summer as my favorite trend, which mainly refers to the bold colors of different gemstones. With that said, I do love a good partially-colored or bi-colored tourmaline. Well it most definitely would not have roses in it – my fiancé knows I hate roses. This is mainly because I had this creepy stalker during college and he would leave me roses on my car and on my front stoop – haha. I love black dahlias and dark purple anemones. I've had lots of time lately to look into my jewelry box and reinvent some pieces that don't get much use. I hardly ever wear necklaces, so I've been turning lots of charms and pendants into rings. They are much more fun now and I'll wear them more! I would sit and watch an episode of Broad City on demand. It was a tanzanite pendant set in yellow gold from a local jewelry store where I grew up. I was in 7th grade and I put it on layaway. I used to do chores around the house and pay on it every month! I still have it. This is the toughest question of them all – but I think I would have dinner with a young Elizabeth Taylor because I feel as though we would connect on so many different levels over our shared love of jewelry. I would enjoy showing her my personal jewelry collection and I would have loved to have seen hers in its entirety. My grandparents' wedding bands, for sure. They were married in Italy before coming to America and immigrated in the '50s – they have a unique story. Not having enough money for both of them to journey here, my grandmother came first by herself on a boat – 8 long days and nights. Meanwhile, my grandfather served in the Italian Army and saved his money for an entire year before he was able to make the trip and be with her. Their wedding bands are 18k gold and hand engraved...I wear them on a chain. I drive a Toyota Prius which I bought brand new when I first moved down to Tennessee. I left my Audi up north because I didn't want to drive it 12 hours by myself. Who does that?! But, I'm proud to say it is about to hit 100k on the mileage and I drove every single mile on that thing! Eminem, Jay Z, Michael Jackson, lots of '80s one-hit-wonders and currently obsessed with Selena Gomez. DON'T JUDGE. On the rare occasion that I would have guests over for the weekend, we would all know better enough to go to a restaurant and not involve myself in the kitchen. But I'm really good at making guacamole. Channing Tatum, don't tell anyone. I have yet to find a women's perfume that I love – I'm mostly into men's cologne. I've always had a thing for the feminine lines and silhouettes of Chloé. I use almost all Revlon products, I love Revlon. My skin and moisturizer do not mix – it usually leaves my face oily and I break out from it, so instead I use canned grape water that is in an aerosol container; it looks like hairspray. I also can't live without my Wet Brush which my hair stylist turned me onto. Will forever be a fan of red lips and black nails.